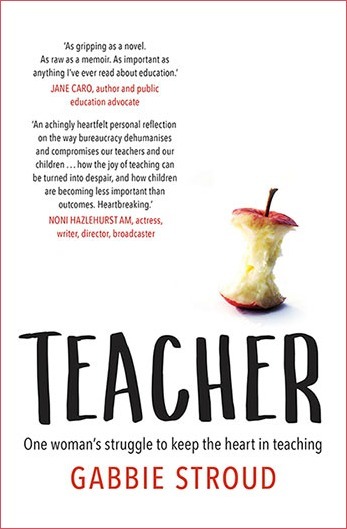 Teacher, by Gabbie Stroud, is a book for adults, published by Allen and Unwin (2018.) RRP: $Au 29.99. Teacher is a book that I believe will have wide appeal. It is well-written and compelling. The format is memoir, with Stroud sharing details of her teaching career as well as snippets of her personal life. It certainly makes for fascinating reading. There were so many pages I nodded and grinned over, and yes, there were places I wiped away tears. The descriptions of staff meetings made me cringe. There were heroes, there were villains, there was violence, drama and exhaustion. The pace is unrelenting, the honesty is unflinching. This is a realistic look at what it’s like to teach in Australian schools. I would love to think Teacher will be shared widely and inspire change. In many ways, it explains how our current education system is ruining the heath and the lives of teachers, and letting down children and parents. I very much liked the easy conversational but compelling style. However, it broke my heart to read about the way the system grinds people down. Statistics are all very good in their way, but to truly understand a situation, I believe you need to immerse yourself in real stories. Teacher is such a story. I recommend it to anyone who has taught, and especially to those who are concerned about education. You might also be interested in Recommended Books for Older Readers 2018 (2).